Rollaway beds are intentionally used for providing sleeping surface for overnight guests. They are convenient to use due to the unique design. The fact is its convenience in uses is the main reason people choose it. However, there are plenty of options when it comes to choosing a rollaway bed. They come in a variety of prices, models, and manufacturers. This article is going to offer you a list of best rollaway bed, so you can feel less confusing with the maze of options out there. To help you save money, i just publish article about top 10 best bed frames for you. Rollaway bed is also known as folding bed due to the ability to be folded and unfolded. It can be misunderstood that rollaway beds have been in the market for a while; the fact is it appeared and became an extra bed for guests long ago. That means he main purpose people use it is for providing an extra sleeping surface when they have guests wanting to stay overnight in their houses. To describe a rollaway bed, the construction of a rollaway bed consists of two main items, which includes a bed frame and a mattress. Mostly, the frame is made of metal. The heavier the metal is use, the sturdier the whole bed is. With the diversity of options nowadays, the frame can be made of wood as well. For the mattress, as the cheap prices of the rollaway beds, memory foams are mostly used. The thickness ranges from 3 – 6 inches. What Are The Different Types Of Rollaway Beds? Standard rollaway bed – the frame of this type uses angular or tubular steel. In addition, it is designed with a plank that supports the mattress on top. Lastly, the width of the surface bed where you put your body on varies, including: 30″, 36″, 39″ and 48″. Cabinet Rollaway Bed – This bed is like a trunk but has the frame. It can be folded neatly and often equipped with wheels. Cabinet beds come in 3 sizes, twin, double and queen size. Cabinet is equipped with wheels for easy transportability. Ottoman Rollaway Bed: it is also known as folding Ottoman bed. 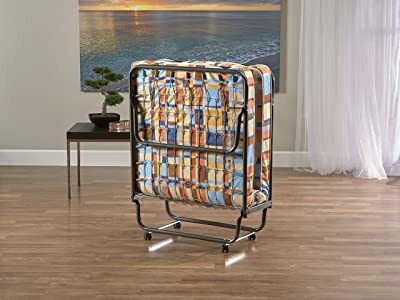 It can be folded up in thirds to create an ottoman. But, the shape folded isn’t as neat as the rest. Why People choose Rollaway Bed? Affordable price – in general, a rollaway bed costs around $150. This is fairly affordable for the majority of users to purchase. 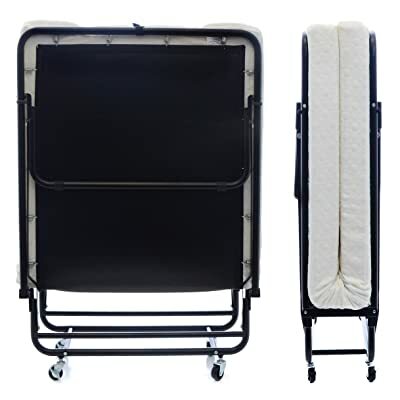 Easy portability – it is deniable about the convenience of the easy portability of rollaway beds. They can be folded up to become a neat shape. They are light in weight to feel hassle-free. And they are equipped with wheels to drag effortlessly with one hand. Compaction – they comes in small sizes, as compared to a real bed. This helps save the space in the room. After being folded, they even becomes smaller and neater in shape, so they can be stored hidden somewhere in your room when not in use. When it comes to shopping, choosing an item isn’t difficult sometimes. You have to consider a lot and even think over before making a purchasing decision. We know this, and want you to feel comfortable with your shopping task. That’s why we are hand-picked the list of best rollaway beds for you. They are those that get plenty of feedbacks from customers. Things that proves they are widely used and preferred by users. Let’s give our list a quick look, and then make your own decision! Most importantly, a folding bed can provide the comfy feel when sleeping and convenient to use. This Milliard Premium Folding Bed is a good combination of those. What’s more the bed is fairly durable to constantly use in different situations. The whole bed consists of a memory foam mattress, cover and metal frame. All of them are made of good quality materials for providing the maximum comfort and support. For the mattress, it is built from a 2.5 pound memory foam mattress and about 4 inches in total thickness. For the cover, it is made of a soft and durable fabric that can prevent from wear and tear during different usages. Lastly, the frame is made of sturdy and durable metal, which features assisted-folding, double-reinforced stabilizer bars. With 4 inches in thickness, the mattress isn’t too thin or too thick. As the common feel of memory foam, it is soft to touch, but the memory foam used for this bed is medium-firm feel. This just helps itself avoid flimsy feel. Instead, it will provide you the comfy feel and support. When you lying, it will contour to your body nicely and let you feel relaxed. Plus, the bed will be bouncy a bit. This just adds a bit comfort rather than a feel of instability. Lastly, the whole bed is very sturdy to hold up 300 lbs. All the features designed for this bed are aimed to provide the easy portability. First, it is light in weight so that it won’t cause any bulky feel when taking it from place to place. Second, it has legs that automatically fold out when the mattress is parted. Third, the bed has 360 degree pivoting caster, so it can be effortlessly taken from place to place. When stationary, 2 wheels lock in place. Every task can be done with a big convenience. 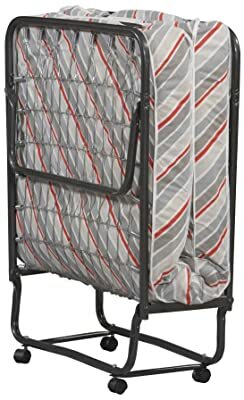 Where / Who may Need This Milliard Premium Folding Bed? Choosing a mattress from a well-known mattress company is good in reducing the concern of poor quality, but whether this option is an exception? Let’s see what this LUCID Rollaway bed has and get your own opinions! Firstly, the memory foam mattress is built from 1-inch of memory foam and 3 inches of support foam, totaling 4 inches in total thickness. This is a moderate thickness that can ensure the comfort and support. Secondly, the mattress is wrapped by cover constructed from rayon from bamboo. Due to this component, the fabric of the cover is super soft, highly breathable and allergen-free. All these add to the comfort feel while sleeping. Lastly, the frame is made of sturdy and durable metal, which has great strength while it is supporting your body’s weight. If you concern about how high it is, the bed frame is 12 inches high with 11 inches of clearance. Personally think that, this bed does not sit very high off the ground. The mattress is made of moderate thickness memory foam. This won’t be easy to flatten out within short time after unboxing. Along with that, it has medium firm feel, meaning it isn’t too soft to feel the frame underneath. It just provides you the comfort and great cushion. Overall, in terms of comfort, the bed can perform well. However, it does contain odor after unboxing. You may need to let it air out, and then it can go away quickly. The bed is designed to set up of fold up within a few minutes and does not require any tools. You just need to fold down the two legs at the bottom of the bed. In addition, the two crossbars and four wheels are also easy to be folded up or opened. Lastly, it is quite neat and light in weight, which reduces any hassle when needing taking it from place to place as well. 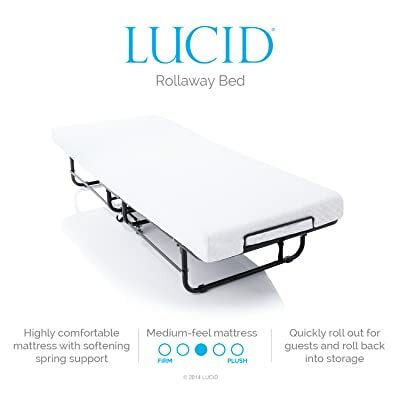 Who may Need This Lucid Rollaway Bed? Choosing a rollaway bed doesn’t mean we have to ignore the comfort coming from with it. With the thicker mattress included, this Hospitality Rollaway Bed can ensure you a restful sleep through the night like you sleep on a regular mattress. Actually, materials used for making construction determine how durable the bed is and how it feels. In this perspective, this Hospitality Rollaway Bed is made of these following materials: The frame is made of heavy steel. Hence, it can be strong enough to support any body’s weights. Along with that, it features double braced angle steel frame, which gives extra rigidity and long life. Meanwhile, the mattress is a 6″ Tufted Premium Innerspring Mattress. This is obviously thicker than many rollaway beds available out there, but it has its own purpose. First and foremost, this Hospitality Rollaway Bed has two outstanding features. First is the width of the bed, it is 39-inch wide. This makes it wider and helps sleepers feel very comfortable in all sleeping positions. Second, it has thicker mattress when coming in 6 inches in thickness. This adds extra comfort, and makes sleepers feel like sleeping on a real mattress. But the disadvantage coming from with this can be bulky when needing to move it from place to place. Third, the coil spring foundation makes it bouncy and responsive, which can enhance the comfort as well. In addition, it provides a quick response to your body’s movements and reacts intelligently to individual body contours. Lastly, weight limit is also a big concern when choosing the rollaway bed. So, what is maximum weight this bed can hold up? It is about 270 lbs for the weight limit. Basically, there is no hassle or struggling with when using of this Hospitality Rollaway Bed. It can be folded or opened up easily. It will take you no time to lower the legs into the proper position for use. However, due to the thickness of the mattress, it can be bulky a bit to move it from place to place. Additionally, there is a disadvantage coming with the wheels because they do not lock, which may cause it move, but the solution to stop it is you position the swivel wheels perpendicular to the fixed wheels. 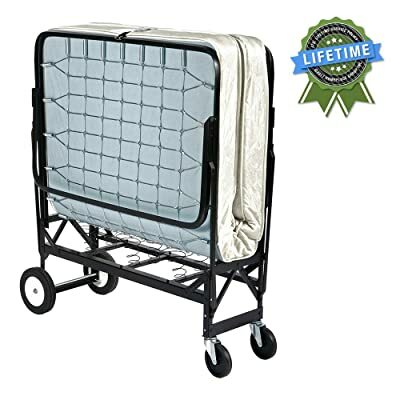 Who may needs this Hospitality Rollaway Bed? The next recommendation would be a folding bed manufactured in Italy. It is called Milliard folding bed. But, what this bed can offer you? Let’s see the following features! The mattress that comes with this bed is made of foam, and it has 4 inches in total thickness. This thickness is popular in rollaway beds. For the width, it comes about 31 inches wide, which a big guy can fit. And, for the length top to bottom with the wheels on, it is about 40 inches. Along with that, it has metal frame, which is strong and sturdy to hold up 264 lbs. This means the frame is fairly sturdy to accommodate heavy sleepers. Additionally, if you are planning on using it with normal uses, it is also strong enough to withstand constant use over many years. Basically, the surface of the bed isn’t too narrow to fit a big sleeper. You can be comfortable any sleeping positions. The mattress can provide the great cushion in general, but it may let you sunk far down into the mattress if you a heavy sleeper. Additionally, in terms of durability and sturdiness, it can withstand the normal uses and won’t collapse within short time. In general, the design of this bed can allow you to use it without any hassle. Even, the bed is lightweight enough to be handled alone. Along with that, all the features attached to the bed are easy to adjust or remove. The lightweight also makes it easier to move from place to place. Who needs this Milliard Bed with Mattress? What is your most important feature when it comes to choosing a rollaway bed? Is it the material for frame or how comfy the mattress is, or else? Obviously, each purchaser has a different priority for this. What makes the frame of this Linon Home Decor Luxor Folding Bed different from others is about the combination of materials. It doesn’t include the metal for the whole frame, instead, it has the wooden slats that supports the mattress. The slats is claimed to be durable and Euro style. However the fact it turns out to be a big concern of poor stability from users. In addition, the mattress is made of Polyurethane foam, not memory foam. This is considered to be poor at providing quality as well. Lastly, the mattress is covered by a Beige Damask Fabric. This is generally soft and nice to touch, but as aesthetically speaking, the beige color scheme doesn’t make it cute look. The overall feel of this bed is good, meaning can provide enough cushion for sleepers. Along with that, it isn’t too thin or too soft. Hence, you can be comfortable on it all night long. However, it may be a bit narrow in width, so big guy may not feel really comfortable to sleep in his own favorite sleeping position. However, it would be a slight exaggeration to say that you should never worry about the stability of it. Especially, the bed will make noise if you move around while sleeping. In addition, the plastic latch that keeps the folding bed from opening from the top seems to be made of bad quality one. It loses grip easily. Moreover, it isn’t long enough to actually reach the other side of the frame. Who Needs This Linon Home Decor Luxor Folding Bed? If you are looking for a rollaway bed that comes with a removable cover for the mattress, this pick can be your best choice. However, more than a convenience of cleaning, this Layout 75×31.5-Inch Metal Folding Bed offers many great features that can please you. Let’s see more! The bed is built from 100% metal bed frame, with reinforced stabilizer bars, firm poly deck mattress base. This can ensure the stability, sturdiness and strength for the bed when it has to hold up the heavy weight. 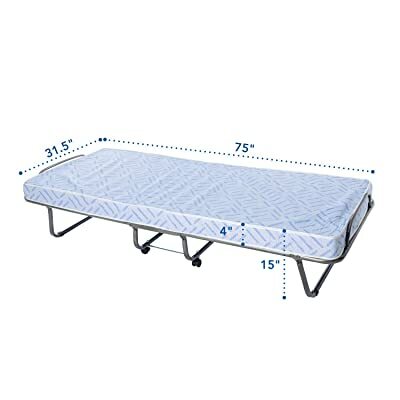 In addition, it comes with a 4-inch thick mattress made of a combination of 3 inches of high quality polyurethane foam and 1 inch of memory foam. And, this mattress is wrapped with removable cover. Plus, the cover is made of extremely soft fabric, which adds an extra comfort and a nice feel to sleepers while sleeping. The 4 inches of thickness is good at providing great cushion and comfort for sleepers. This isn’t too thin to let sleepers feel the solid frame underneath. Or, it isn’t too thick to be stuck in the mattress as well. Hence, all types of sleepers can find the comfortable feels with this Layout 75×31.5-Inch Metal Folding Bed. However, the width of the surface where you sleep on may be narrow for some. Anyways, no one would plan on sharing the bed when using a rollaway bed, right? Though the instructions are a bit disappointed, the assembling tasks can be done easily and causes no hassle at all. In addition, the whole weight of this bed can allow you to move it around effortlessly. In general, all the factors for convenient usages aren’t difficult to do. 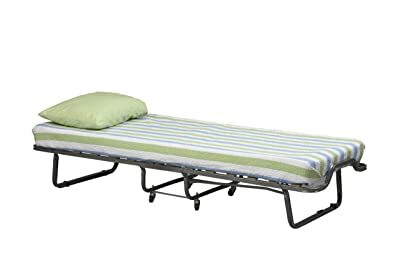 Who may Needs this Layout 75×31.5-Inch Metal Folding Bed? The whole bed is well-constructed with heavy duty steel frame. It is sturdy and stable, which makes it possible to hold up heavy weight up to 300 lbs. In addition, it comes with a memory foam mattress, but it is thin a bit. This helps it reduce some amount of weight, but may not please some sleepers. Many people complain about the thin mattress. Actually, it is firm to prevent you from feeling the solid bars underneath. More importantly, it can provide enough cushion while sleeping on. What’s more? The surface of the bed where you lay your body on is quite wide. This roomy space can help sleepers feel comfortable to sleep in any favorite sleeping positions. Plus, the width of the bed can fit Standard sheets. The bed is awesome with all tasks of opening up, setting up and moving it around. It won’t take you long to do the setup. Especially, it isn’t heavy at all to be difficult when moving from place to place. When in need of storage, it can become a neat shape after being folded up. Hence, it doesn’t take much space in your room. 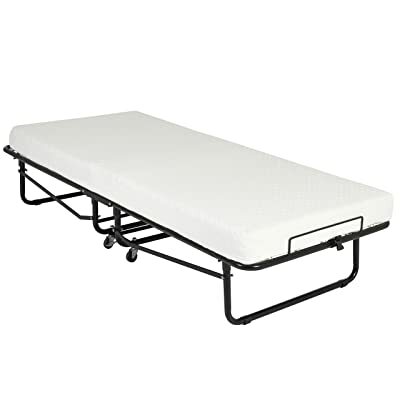 Who may need this Serta 39″ Portable Rollaway Bed? Does any purchaser care about the warranty of a rollaway bed? If the answer is yes, this InnerSpace Standard Folding Bed will be worth your consideration. That’s because it has 5 year of warranty. Certainly, it can offer you more. Let’s give it a look! For the frame, the bed is built from metal, but what makes it special is the flexible metal mesh base. This enhances the durability of the bed, and helps to support the weight better. Meanwhile, the second important feature of a rollaway bed – the mattress is made of high density foam mattress. It is 4 inches in thickness and firm in feel. In general, the feels of the bed is good, and no complaint can comes with it. The mattress firmness is comfortable to please all type of sleepers. The 4 inches of thickness won’t let you stuck in the mattress as well. More importantly, the bed is sturdy enough to hold the heavy weights. Additionally, the bed doesn’t make noise when you move around, which can disturb you from sleeping. Generally speaking, the Innerspace Standard folding bed can bring you the convenience of usages, and easy to use. That means you can set it up within a few minutes, or you can fold it up when not in use without struggling, or you can drag it around effortlessly. Who Needs This Innerspace Standard Folding Bed? Best Choice bed is another recommendation for you if you are still confusing with a maze of choices out there. This bed comes at affordable price, and still has many good features included. Let’s see its below features to see whether it is worth your money! This Best Choice Bed consists of Bed frame and a separate mattress. The frame is constructed with two metal support bars that fold out and 32 carbon steel springs. Meanwhile, the mattress is made of memory foam, totaling 3 inches in thickness. Additionally, the bed is equipped with wheels on the bottom, which makes it easily transportable, but still secure with the lock to keep in place. In general, the bed does perform well in providing comfort. The 3 inches of thickness can contour to every curve of body, and let sleepers feel support. 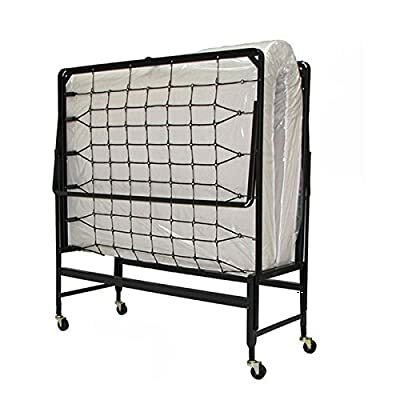 For the frame, the metal used is fairly sturdy and good, which helps the whole bed strong and stable to withstand any types of sleeper’s weights. For the weight limit the company claims, it is about 300 lbs. All the features included in the bed are designed to be simple to use, to set up or to fold up. Hence, users can feel hassle-free with Best Choice bed. Especially, when being folded, the bed just has 10 inches wide, which is very space-saving. Who May Need This Best Choice Bed? The last recommendation in the list of rollaway bed is Linon Verona Folding bed. 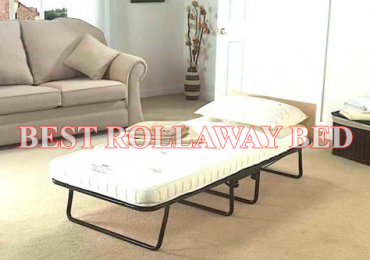 One of the most affordable rollaway beds in the list, but it can provide you more. Below is what you may need to know about it. The frame is made of metal and a mesh of metal to support the mattress on top. This can ensure the stability and sturdiness for the whole bed. In addition, people are into the thick mattress can feel pleased with this Linon Verona folding bed, because it has 5-inch mattress. With the good thickness of mattress, this can make you feel more hug and contour while sleeping. In addition, the sturdy frame can wipe away your fear of collapse while moving around during sleeping. Generally speaking, the bed can perform well with normal uses and occasional uses. Setting up, folding up or moving around can be done easily and effortlessly. 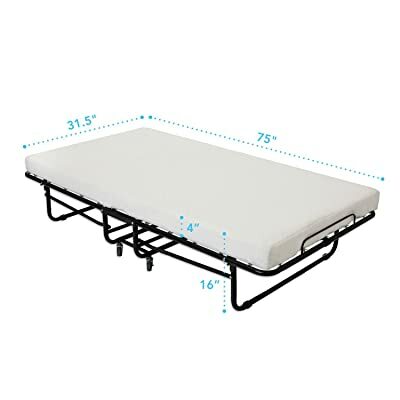 Plus, the total weight of this bed is light, which causes no hassle or bulky feel when in need to relocate the bed. Overall, it is easy to use. Who May Need this Linon Verona Folding Bed? Hopefully with the best rollaway bed list we’ve reviewed above. You will find the best product for overnight guests and your baby. You can check more our reviews about beds on the market on 2018 here.